A few ideas from a newbie. Forum » Writing Help / Help: Ideas and Brainstorming » A few ideas from a newbie. Six ideas that I've come up with and started working on that I'd like to get people's feel for. Alright, so I've brainstormed and came up with several ideas. I kinda wanted to see what was liked before I spent time developing something, only to have it shot down. 1) c.19th century Daguerreotype Photo. This was one of (if not the) first idea I had for an item. I know cross-over and spin-off items aren't exactly popular, but I'll tell you about it anyway. The photo is obviously old of a young woman in period clothing. The origin being that it was found in an antique shop and bought because in the background of the photo, despite its age, there was a video camera on a tripod. After purchase and later review, the background changed to that of a different room. After coming into the Foundation's possession, one of the rooms featured happened to be one of the recorded rooms of SCP-083. The identity of the woman and the source of the photo are under investigation. I came up with this because I happen to love when photographs do weird shi… Stuff in stories. I originally thought images taken inside 083 would also change, but that would mean the recovered surveillance devices' footage would also change, so that was shot down. After bringing it up on the SCP chat, it was changed to be the camera that causes the effect, rather than the house. No, it isn't THAT lame. It's a small, ornate hand mirror that reflects everything in the environment EXCEPT living things. Looking into it reveals a set of empty clothes sitting in a chair with other clothes, glasses, toupees, etc moving about as people would. The down side is, people looking into it become transfixed, believing if they stare long enough, they can see themselves. After staring for some length of time, the viewer does start to see himself gradually fade in. When this starts to happen, the subject begins to fade out of existence. Mirrors are like photos for me, in that they have so much potential to be creepy. A fountain pen that appears and operates as a normal fountian pen would, except when it comes to writing and signing contracts. At that point, any ink in the pen tranforms to blood; the blood of the wielder. Anything written will be taken as literal as imaginable and, once signed, the contract's terms come to fruition. The cost? You guessed it, your life. Depending on what is gained through the contract, the author dies within a few minutes to several years. The 'nobility' of the contract doesn't have any bearing on the time frame, just the reward gained. Also, if the author tries to pen something that would create a paradox ("The undersigned shall live forever.") or terms the pen doesn't feel are 'fair', the blood will fade away. I know there's a couple 'possessed pens' on the list already, but I liked the idea. A cellular phone of unknown make sporting a full keyboard (including several characters with unknown meaning) and a very rudimentary screen showing the letters entered and a 'signal strength' indicator. When a person's name is entered, any communication device near that person begins to ring as a telephone. Cellphones, telephones, walkie-talkies, even things that merely appear as phones (a child's play phone, for example). Any caller ID indicator will simply show 'unknown caller' or '000000000'. Phone records will show no call activity for the duration of the call. The catch being that nobody can call the phone back and every so often, the phone does ring (with the display simply stating 'incoming call') and, when answered, the listener is treated to a cacophony that sounds like hundred of voices speaking at once in unknown languages. The sounds continue as long as the listener cares to stay connected and short-term exposure isn't harmful. But after a while, the sounds become more violent and grotesque and the listener starts to hear these voices even after hanging up. Might even work in alternate realities. I wanted to come up with some kind of universal communication device that would work anywhere, but I need a good catch for it. I really like this idea, personally, but need to flesh it out more. A steam-punk style pistol approximately 20cm long with a flared brass muzzle, wooden handle, brass trigger, four glass tubes protruding from the back and a pump on the rear. The user 'pumps' the device, each 'in' stroke causing one of the tubes to gradually glow. Device can be activated with only one tube active, but effects are (you guessed it) a quarter of the full effect. When fired, the devices emits a directed burst of an unknown radiation that only affects non-carbon atoms and inorganic material (something about protein chains 'deflects' the radiation). As a result, living creatures and carbon-based structures (diamonds, carbon-fiber sheets) are completely unaffected. Other forms of solid matter, however (metal, stone, sand, etc) are 'destabilized' and become intangible. Objects are able to pass through the affected object or area as if it were air. Matter interacting with affected matter causes a 'ripple' effect, similar to a stone in water. As such, sufficient velocity can potentially cause a 'splash' in the target, dislodging some material. Gravity seems to have little influence on the target (ie: a piece of metal suspended from the ceiling won't 'drip' or a section of wall won't 'flow' down). The effect lasts anywhere from three to 15 seconds, depending how charged the device was when activated and how far the device was from the target. The area of effect expands as it leaves the device, creating a three meter radius of effect at its maximum range (limited to 10 meters). At point-blank range, the AoE is only several centimeters across (I don't have a ruler handy and I'm horrible with estimations), but depending on the density of the material, it can penetrate almost the full 10 meters (allowing you to, say, shoot a reinforced wall and throw a grenade inside). The overall effect is similar to SCP-170 (Tube of Superglue), but ineffective on organic surfaces. When the affected area re-stabilizes, any ripples or dislodged pieces solidify as-is, so a 'splash' of granite can be left behind. Any object left inside becomes 'fused' to the target (again, similar to the superglue) as their atoms are 'woven' together. A living target can have an extremity trapped in a wall (very painful), but can be released by 'shooting' the wall again before any permanent damage is done. However, if the heart, brain, etc are still inside when the object solidifies, the subject is essentially dead, as the heart wouldn't be able to beat or the brain synapses wouldn't be able to fire. The device itself would be rather fragile and its power source would be some derivitive on vacuum energy, so breaching the main body would effectively destroy the device. As a result, it wouldn't be practical for field use. You can probably tell by my description of this item, it's my personal favorite. Please be especially gentle tearing this one to pieces. That's all I have for now. I'm trying to come up with some more 'creepy' objects, but nothing that just plain kills people and is indestructible and, oh yea, if you try to stop it, it'll just teleport inside you (ie, SCP-260: The Tracking Stone). Re: A few ideas from a newbie. …Well, the mirror one could be good, anyway. Numbers two and six, I gotta say, are really bad SCP ideas. Thoughts for a new person, from a new person. 1) This one could be spiced up nicely to become SCP material, but as it stands it's just weird, not particularly scary. 2) … this is an X-man, sorry. I think the idea of an item that freezes things in place for short periods of time could be interesting, but turn it into a person and it'd work better in a superhero setting. 3) Focus on this one. Play with the idea more. What else happens when someone starts to fade out of our reality, and into the mirror? Do they sometimes appear in the mirror despite not being in the room? Can they affect things the mirror shows? 4) This sounds familiar, somehow. I think you should focus on other ones. 5) Yes, flesh it out more. I think it could be interesting. 6) … rewrite it so it's easier to catch what it is at a glance. My first impression was that this was a weapon (which wouldn't make for a good SCP generally), but it's something far more interesting. Maybe play with some of its consequences to get something decently spooky. Another newbie here to comment. 1) Agree with Dr Fox. Not all SCPs have to be creepy, but if they're not they need to be compelling in some other way to be successful. The idea as it stands is a good starting point, expand on it. 2) You're going to hear this a lot, but it is indeed an X-man. If you ever make an SCP that you would like to be, yourself, personally, that's a good indication to step back and rework it. 3) I'm not grabbed by it, but the idea isn't a bad one. Again, develop it. 4) If I were to take this one I'd change it so that both users have to sign with the pen for anything to happen. Make the curse apply only if one party breaks the terms of the contract. Play up the horrible things that happen as a result of the curse, and it begins to sound like a good SCP entry to me. 5) Not sure where you're going with this one. We already have a haunted answering machine, so in a way the idea's been done. 6) A corollary of "don't make SCPs you's want to be" is "don't make SCPs you'd want to own". Most of the time. If it's done it needs to be done subtly, and a steampunk phasing gun with cool twirly bits isn't the way to do it. I like the concept, but maybe change the device from a gun into something bulkier and less suggestive of an FPS gimmick. Sorry if it seems like I'm singling you out, Simplecadence. Dr Fox's comments were constructive, yours came across with an undertone of "RTFM N00B!" I apologize, that's not at all what I meant. Especially since I've only been here for a week and a half, and haven't published any articles of my own yet. If you think something is a good idea, go ahead and do it. The worst that can happen is people won't like it, and that helps you figure out how to do better. God knows that's my strategy. For the record I love steampunk. I just felt that, in the case we were discussing, it was there to be cool, not to enhance the story you were trying to tell. Write it up and prove me wrong, a lot of times things don't sound as good in summary as they do when all is said and done. No, no, cadence is right. People are calling out #2 as a superhero because he has a superpower. 1-Not particularly scary or interesting IMO. 2-As previously stated, he is an Xman. I do really like the idea of being able to temporarily "suspend" things in another dimension and manipulate what parts of them show in our reality. 3-There are SO many mirror SCPs. However, if you don't make it into an SCP, I would put it in the list of anomalous objects. 4-I have always found things that affect people around the user or even through the user more disturbing than things that affect the user directly. Take that how you will, but as it stand now, I do not find this one that interesting. 5-I think this would be more interesting if calls on the phone start out completely normal, but slowly the voice of the person on the other end warps to become more and more hellish, rather than random voices. 6-It is an interesting concept, but it seems to fall prey to the "useful item" virus. Take the "suspend matter" ability and apply to an object rather than a person. I thought about it for like a minute and came up with: an object (say an orb) which emits a light radiation which freezes matter, as you say. It pulses, so when it turns on, all matter struck directly by the light is frozen, and when it's off, movement resumes. Let's say the radiation can go through a certain amount of material, like a spread affect (such as through a person's whole body rather than just their skin), but it couldn't go through a wall. Thus, it's containable, but it could also be used to focus it's ability by say, setting it up so it's projected only in one direction. It could be discovered by the Foundation when some criminal gang or military is using it as a torture device by focusing beams of it onto say, a victim's chest to stop their heart, or a victim's limb to stop blood flow and cause the limb to suffer cell death. Just an idea, wouldn't mind if you stole it or disregarded it entirely. But if you think of an interesting ability, it doesn't HAVE to be a superpower. …No. Not an orb. Nor a cube, nor any other geometric shape. Pick a random object if you must, but please for the love of god, no more geometric cop outs. Other than that, this could be a good idea, though. You'd have to write the hell out of it, but with the right spin, it could work. Maybe a lantern? Um, that's a streetlight… Which is an interesting idea, really. Imagine an apparently perfectly normal streetlight that at seemingly random and highly spaced out intervals emits a pulse of light with this "freezing" effect. People on the street would suddenly stop moving. cars would come to an immediate halt. even the whisps of smoke over the buildings would hang, for a moment, unmoving. Then, the effect wears off. Life continues as though nothing happened. Later in the day, a businessman may notice that his watch is off by a few minutes, and decide that that must be why he was a tad late for work today. And no one would ever be the wiser. It could be years before the anomaly was discovered. Yes, I know it's a streetlight. 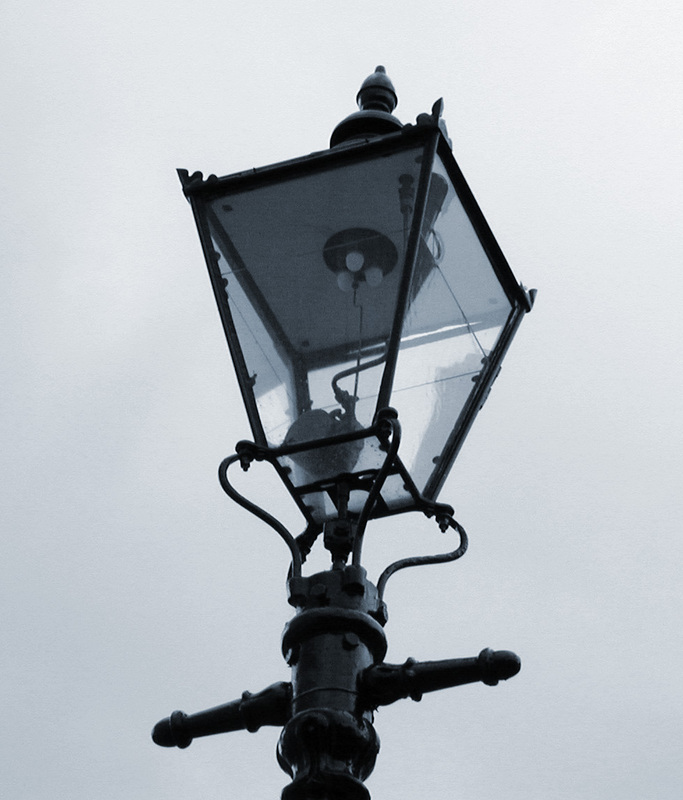 I specifically googled for an image of "gaslamp". k, I said object, "say an orb," for the sake of just moving on because what object it is didn't matter for the description. Doesn't matter for debate, either. Moving on, I'd like to know if tomatogoatee has put any further thought toward these ideas. A couple of them did have potential, and it'd be a shame to let that waste away.